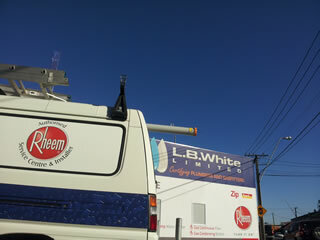 L.B White Ltd are Wellington's leading Rheem representative - both installing and servicing Rheem products. We represent Rheem from Wellington South and the Wellington CBD, through to Lower Hutt, Upper Hutt, Porirua, and Plimmerton. Doing business with Rheem means dealing with the market leader. 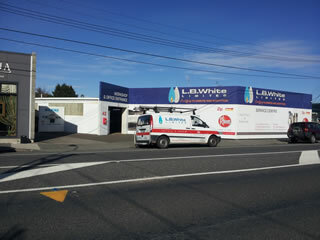 More Rheem water heaters are sold in New Zealand than any other brand. That’s a testament to the quality, performance, efficiency and range of Rheem water heaters. Rheem designs and manufactures hot water heating products that are top performers in delivering water at the optimum water temperature - longer. Rheem hot water options such as Mains Pressure Electric, Optima, Mains Pressure Gas, and Stellar provide a hot water flow rate of 40 litres per minute. Rheem Continuous Flow is a gas water heater that provides virtually endless hot water. Rheem provides a wide range of highly efficient water heating options. Rheem Solar uses high efficiency collectors and technology for both residential and commercial purposes. The Rheem Heat Pump is extremely energy efficient, in fact it can deliver savings in New Zealand conditions greater than a solar water heater without the need for collectors. The Stellar gas option utilizes advanced technology that extracts additional energy by recycling and condensing the flue gases - ultimately improving on energy efficiency. Mains Pressure Electric - Rheem's largest range of residential hot water cylinders - surpasses MEPS energy performance standards. Simply - Rheem is efficient water heating! Revolutionary Rheem developments ensure concerns for economy and environment are merged in cost-effective, high performance systems for every home. Ultimately, high efficiency = low running costs. From eco-friendly options such as Rheem Premier Solar, which can cut your water heating bill by 70%, to insulation qualities on many Rheem products that keep water temperature at its optimum - saving energy, and consequently your dollars. Rheem reliability is borne out by its overwhelming popularity in Kiwi homes and businesses - with 1.2 million hot water cylinders having been manufactured in New Zealand. Rheem vitreous enamel lined cylinders are strong, durable, and resistant to corrosion in a wide range of New Zealand's variable water conditions. The quality of Rheem products is backed by their long life warranties. Rheem is committed to providing products that are backed by ... "a national network of after sales professionals ... and the Rheem After Sales Network ensures you of expert technical advice and fast service". LB. White are part of this Rheem After Sales Network and we strive to work to Rheem's high standards of after sales care and service in the Wellington region. Families looking for practicality and top-quality performance in Gas, Electric, Solar or Heat Pump water heating can rely on Rheem to provide a system to suit their lifestyle. View our residential & commercial water heating options from the main menu. Rheem has long life warranties on most of its products. Water heater warranties are for single family premises in New Zealand only. Please contact us for Rheem's full warranty details, including commercial warranty information.